With over 80 years of engineering experience, Civil Engineering is one of the pillars of our consulting disciplines at Woolacotts. Our team of experienced Civil Engineers play a key role in delivering high quality projects to a range of clients. Our Civil Engineering team have been involved in a variety of projects across a range of sectors, including community infrastructure projects where they have designed and delivered an array of public domain upgrades, cycleways, parks and roadworks. The Woolacotts Civil Engineering team is led by Principal Engineer, Justin Chirillo who has been with Woolacotts for over 17 years. Justin leads a team of experienced civil engineers and drafters, including James Georgiades (Senior Civil Engineer), Alex Phillips (Civil & Structural Engineer), Tim Cook (Civil Designer), Jessica Kelly (Civil Drafter), Selina Cheng (Civil Drafter), and John Htet (Graduate Civil & Structural Engineer). This well experienced team bring together a diverse range of skills and knowledge to deliver high quality civil engineering projects for our clients. Our Senior Civil Engineer James Georgiades has recently been involved in undertaking detailed flood studies and analysis utilising the TUFLOW modelling program. TUFLOW is a hydraulic modelling program that provides one-dimensional (1D) and two-dimensional (2D) solutions of the free-surface flow equations to simulate flood propagation. The program links 1D and 2D attributes, providing a detailed result of flooding behavior within the study area. Output results provide a visual representation of overland flow paths, as well as identifying areas of potential inundation which is a valuable tool that can be used during detailed design. 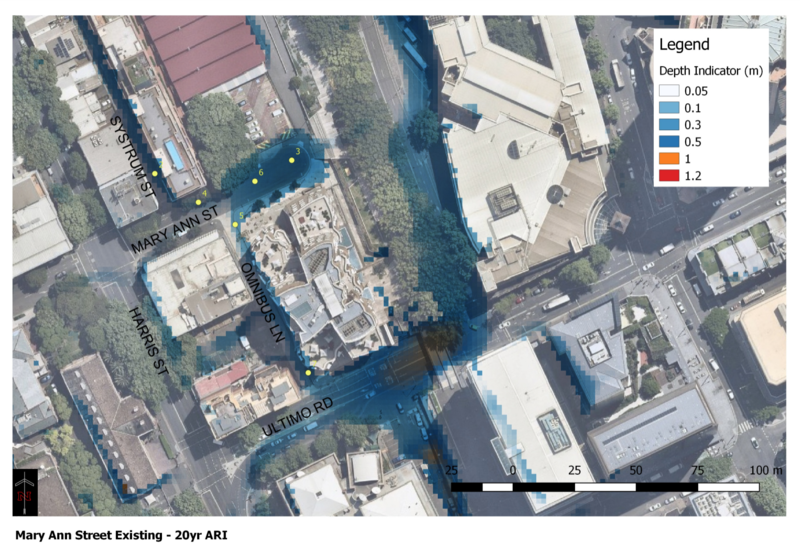 TUFLOW has been used successfully in the flooding analysis of a wide range of Woolacotts projects including Rozelle Bunnings, Clarence Correctional Centre in Grafton, Wilson Street Cycleway, and Quay Street Streetscape upgrades. James has also been involved in assisting our clients at Sydney Olympic Park, specifically providing high level advice with regards to the proposed design of the Gross Pollutant Trap servicing an upstream catchment of approximately 110 hectares. Through a review of the existing and proposed systems, we were able to identify a critical opportunity that would improve the efficiency of the system, which ultimately lead to a saving of approximately $250,000 for the client. Following the successful outcome of our performance within this project, the client has engaged Woolacotts to undertake an additional 4 new projects and has also commenced engaging the services of our structural team. Our Civil Engineering team in QLD is represented by Jessica Kelly, who joined Woolacotts in 2016 as a Junior Civil Drafter. Prior to commencing at Woolacotts, Jessica served 6 years in the Navy and was posted to HMAS Gascoyne as a Marine Systems technician where she was in charge of maintaining the main propulsion engine, diesel generators and auxiliary equipment i.e. fuel transfer systems, refrigeration and the sewerage treatment plants. After a 3-year sea posting, Jessica was assigned to the fleet support unit where she was a member of the electrical section, responsible for the planned and corrective maintenance onboard ships. On completion, Jessica received a Diploma of Engineering (mechanical trade). Jessica has undertaken 3D modelling on various sites, as well as the documentation of roadways and public domain upgrade projects. In July 2017, Jessica relocated to the Gold Coast, providing a solid foundation for the Woolacotts team in QLD, and responsible for undertaking site inspections within the Gold Coast and Brisbane precincts. As a Central Coast local, our Civil & Structural Engineer Alex Phillips has worked on over 200 residential projects on the central coast including subdivisions, flood studies, proposed residences and alterations and additions. Currently Alex is undertaking the civil and structural design of a proposed valve house at Wyong and inspecting the construction of a logistics warehouse in the Newcastle/Hunter region. The experience Alex has gained from working on the central coast has allowed him to develop unique design solutions in accordance with site conditions & constraints. These design solutions result in cost savings for builders while still achieving the architect’s vision. An example of a unique design solution involved the design of a 700m2 proposed residence located in a high hazard floodway. Local knowledge of flooding and soil conditions allowed for a specialized and cost-effective solution where the house was suspended above the flood level on reinforced blockwork walls with flood vents to allow flood waters to pass through. Our Woolacotts Civil Engineering team hold a wealth of unique hands on experience that they bring to each job, using the latest technology to deliver projects across a range of sectors in various locations across Australia. To get in touch with our civil engineering team, contact Justin Chirillo, here.